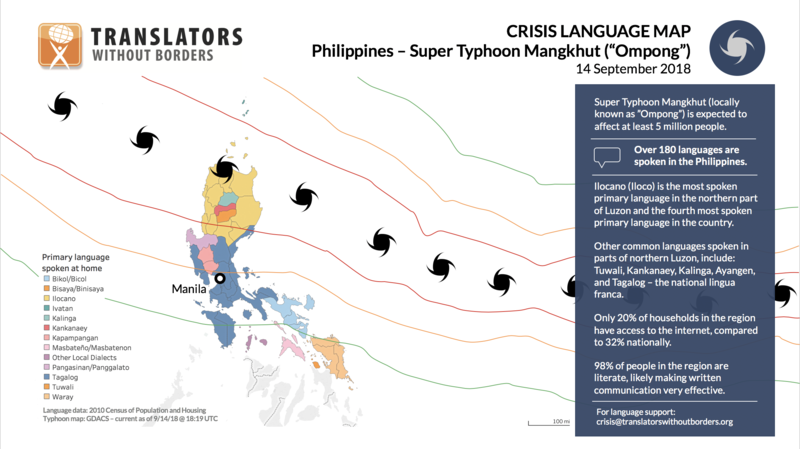 In the early hours of 15 September 2018, Typhoon Mangkhut struck the Philippines, with the eye of the storm crossing Luzon, the country’s largest and most populous island. The storm, locally known as Ompong, primarily impacted the northern Cagayan Province, including the towns of Baggao and Lasam, with sustained winds of 120 miles per hour (mph) and gusts up to 160 mph. Twelve hours after landfall, the damage was still being assessed. Local reports indicated approximately 10,000 displaced people. The Philippines is one of the most linguistically diverse countries in the world, with more than 180 languages. The most spoken language in the northern part of Luzon is Ilocano (Iloco), spoken as a first language by approximately seven million people. Considered a lingua franca in the region, another two million people speak it as a second language. Many ethnic groups are more proficient in Ilocano than Tagalog, which is the national lingua franca (national languages are Tagalog and English). Other languages spoken in northern Luzon include Tuwali, Kankanaey, Kaling, Ayangen, and Tagalog. This interactive map of the Philippines shows which languages are spoken where and includes language data such as literacy rates. In times of need, communication with communities is key. Yet emergencies can strain local communication infrastructure, and those who provide language services may themselves be affected. To alleviate suffering and contribute to rapid recovery, it is important to get life-saving information to communities quickly, including through radio broadcasts and mobile technology, in the languages of those affected. To ensure understanding among less educated individuals and second-language speakers, communication should be short, simple, and clearly illustrated. Important information — including how to access services and where to report abuse — should be provided in plain language, absent of jargon, and with pictures when possible. To find out how to support Translators without Borders’ work in crisis response, email us: info@translatorswithoutborders.org.